John Bellamy Foster’s Naked Imperialism: The U.S. Pursuit of Global Dominance was published by Monthly Review Press in May 2006. It consists of essays written between September 2001 and September 2005, addressing the origins of today’s undisguised imperialism, led by the United States. In addition to a running commentary on the developments over this period, the book presents a critique of this new phase of imperialism and some of its most common interpretations. MRZine recently talked with MR Editor Foster about the book. 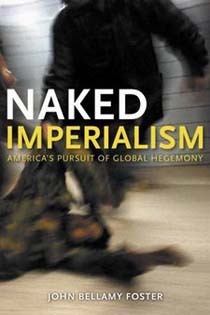 Q: What do you mean by “Naked Imperialism,” the title you chose for your book? A: There has been a lot of discussion of what is called the “new imperialism” — a phrase used to refer to the phase of imperialism since 9/11. The term Naked Imperialism in the title to my book was designed to capture what is most obviously new in the current global assault. Imperialism is inherent to capitalism and only varies in form and intensity. What is new in the post-9/11 period is the fact that U.S. empire and U.S. imperialism is more nakedly promoted than at any time since the Spanish-American War at the very end of the nineteenth century. In 2001, only a decade after the demise of the Soviet Union, the United States, the sole remaining superpower, responded to the terrorist attacks on its homeland by launching a worldwide imperial expansion. The vast U.S. war machine was put into ceaseless motion, ostensibly justified by the so-called “war on terrorism,” but in fact without limits. U.S. global empire was presented as the solution to all the world’s problems. U.S. military expenditures quickly rose to half of all world military spending. The “forward deployment” of U.S. military bases was occurring at strategic points (areas of vital geopolitical interest to the United States) on every inhabited continent. The United States was fighting major wars in Afghanistan and Iraq. This worldwide expansionist thrust was bluntly justified by the political, economic, military, media establishment — what C. Wright Mills used to call the power elite — in terms of U.S. empire. This was a big change that needed to be explained. The four most important factors behind this turning point in world history were the demise of the Soviet Union, the stagnation of the U.S. and world economy, a perceived decline of U.S. hegemony, and concerns over control of global resources, particularly oil. All of them set the stage for the emergence of a naked imperialism — one aimed at global dominance. Q: The antiwar movement’s most famous slogan in the war was “No Blood for Oil,” and this view of the U.S. invasion of Iraq has been widely accepted around the world. U.S. establishment media have been at pains to deny that this is so, and even some progressive U.S. commentators have ridiculed this view as “simplistic” or worse. This is a question you address is in Naked Imperialism. “War for oil” seems to have really touched a nerve, but is this really so central an explanation? Why do you think it has been so widely accepted, and so bitterly attacked? A: It is clear that the geopolitics of oil have changed, and this is a point made in Naked Imperialism. In the chapter “U.S. Imperial Ambitions and Iraq” there is a bar graph superimposed on a map of the world showing very visibly the extent to which the oil reserves of the world are concentrated in the Middle East. There is a lot of discussion today about whether the world has reached or even passed “peak oil” production. No one really knows the answer; there are still too many unknowns, though the peak oil hypothesis is a plausible one. What we do know for certain is what the oil industry calls reserve/production ratios (or simply r/p ratios), which give you the number of years before reserves are likely to be exhausted for various oil-producing countries in the world, based on current production levels. This tells us that with each passing year a larger percentage of the world reserves will be located in the Middle East, since the reserves to production ratios there are far higher. It is obvious then that control of the Middle East reserves becomes more critical each year if world oil supplies are to be secured. The United States has long designated the security of world oil reserves as a vital strategic interest, which translates ultimately into U.S. leverage over the production and sale of these reserves, not to mention the profits to be derived from this. A whole series of foreign policy doctrines — the Eisenhower doctrine of 50 years ago, the Carter doctrine, the Bush doctrine — have been principally aimed at the Middle East, and amount to the extension of the Monroe doctrine (which asserted U.S. hegemony in the Americas) to the Middle East. One of the reasons given by the administration for the Iraq war was to prevent Saddam Hussein from having a “stranglehold” on world oil. Perhaps this was the closest to an honest reason they gave. Beyond the larger geopolitical issue of securing the Middle East and its oil for the empire of capital there is the question of who actually exploits the oil and who profits from it. U.S. and British corporations are now positioned to gain control over the production of, and to reap huge profits from, the Iraqi oil reserves through so-called “production sharing agreements,” which will give them rights to the exploitation and sale of the bulk of Iraq oil reserves for decades to come — even allowing them to book this oil as “assets” in their accounts. In other words they will have the material equivalent of the old imperial concessions system for oil. This is apparently the main thrust of a new proposed oil law in Iraq that was written by Washington and London with the help of leading oil corporations, and that, in accordance with an IMF deadline, is supposed to be approved by the Iraqi government by the end of this year. Defenders of U.S. imperialism in Iraq naturally contend that “It is not all about oil” and try to present the “NO BLOOD FOR OIL” slogan of the antiwar movement as unpatriotic and the voice of irrationalism. They act righteously indignant regarding any suggestion that the United States is planning to loot Iraq’s oil wealth. But it is impossible to deny that much of this conflict is about oil directly. And indirectly all questions regarding Iraq return in the end to oil, which from a geostrategic standpoint is what makes Iraq so important. In a recent poll of Iraqis less than 2 percent thought that the U.S. invasion of Iraq was to promote democracy in Iraq. More than three quarters of Iraqis believed that the single most important reason for the invasion was control of Iraqi oil. Q: The first chapter of Naked Imperialism was written shortly after 9/11 when Washington was getting ready to invade Afghanistan. The argument there suggested that this would be a war for a wider empire not stopping in Afghanistan but leading to a “global-imperial projection of U.S. power.” What led you to such a conclusion so quickly? Now, after five years, how would you assess the balance between the view of a single “U.S.-centric” imperialism and the view that focuses on inter-imperialist tensions and rivalries? A: 9/11 was unexpected. But the response of Washington to it was no surprise. Viewed in historical context, it was clear that the demise of the Soviet Union, which left the United States as the sole military superpower, coupled with the perceived decline of U.S. economic hegemony, created strong pressure among the ruling interests to push for an expansion of U.S. empire. Military interventionism was underway throughout the 1990s. The first chapter of Naked Imperialism lists 15 military interventions that the United States had carried out in the Middle East/Islamic world alone in the twenty years prior to 9/11. The U.S.-led NATO war in Yugoslavia at the end of the 1990s was an indication of this expansionist tendency — in this case in Europe itself. It was in the context of the struggle over the Balkans that the idea of a “new imperialism” started to be celebrated by various establishment figures. It was based on the logic of these developments that István Mészáros argued in his book Socialism or Barbarism (published by Monthly Review Press early in 2001) that the U.S. goal of global hegemonic-imperialism was pointing the world toward what was to be “potentially the most dangerous phase of imperialism” — a position analyzed in Chapter 2 of Naked Imperialism. There was no doubt therefore about the global-imperial projection of U.S. power even before 9/11. And as if to drive the point home, the Bush team issued numerous statements within days of the terrorist attacks making it clear that they viewed this as a new world war — one without geographical limits and by its nature perpetual. Five years later nothing has really changed except that the invasion and occupation of Iraq has proven to be anything but a smooth conquest. The Democrats criticized the Bush administration for its unilateralism, arguing that a stronger coalition among the imperial states should have been devised so that the United States would not carry the whole burden and responsibility. The Democrats have always preferred what Republican national security analyst Richard Haass, who was the director of policy planning in Colin Powell’s state department under the administration of George W. Bush, called the “sheriff and posse” approach, visualizing the United States as the sheriff supported by a posse consisting of the other imperial powers, primarily European states. Instead, a go-it-alone “Lone Ranger” approach was adopted. This has to do in part with inter-imperialist rivalry that remains in many ways the hub of the imperialist wheel. The perceived decline of U.S. hegemony is reflected in the fact that its economic power relative to the world as a whole has diminished somewhat, but this economic power shift has been widely diffused and no state or unified group of states has yet emerged that is clearly capable of challenging the United States economically, much less militarily. At the same time the fall of the Soviet Union created militarily a unipolar world. This meant that Washington was in a position to use its seemingly unlimited means of destruction to leverage greater economic and political power in the world as a whole, and also to strengthen its geostrategic position. Such a move would promote capitalism but also U.S. interests with U.S. capital benefiting disproportionately. One might say that all of this is a product of inter-imperialist rivalry, but with this difference: that it is acted out largely by the hegemonic power and aimed at potential future rivals. The United States is responding to its diminished economic power by using its enormous military power to gain a permanent advantage over all prospective challengers to its rule. The grand strategists are trying to create a “Pax Americana” for a new century — a “new American century.” The global imperial ambitions of the United States and the sheer magnitude of U.S. power might lead one to conclude that the reality is simply that of a U.S.-centric world today and well into the future. But Washington is all too aware (as the statements of numerous national security analysts attest) that power configurations can quickly change, particularly as a result of unequal economic growth. It is therefore seeking to seize the day, grabbing strategic assets and obtaining further advantages over what it regards as its potential geopolitical rivals (individually and in combination) at both the global and regional levels — the European Community, Russia, China, Japan, the Islamic world. If history is any guide, such a grab for power is likely to lead to forces countering it, and generate greater conflict. If this is a unipolar world it is one that already exhibits serious cracks. Q: The last chapter of Naked Imperialism, originally published in June 2005, is entitled “The Failure of Empire.” You wrote it at a time when Washington was making a show of having turned sovereignty over to a transitional Iraqi government and was declaring that the insurgency was defeated. It concludes: “Wider speculation at this point would be foolhardy. But there is no doubt than in invading Iraq the United States opened the doors of hell not only for the Iraqis and the Middle East as a whole but also for its own global imperialist order. The full repercussions of the failure of the U.S. empire in Iraq have yet to be seen and will only become evident in the months and years ahead.” A year and a half has passed, how much of this prediction do you see fulfilled? What back then impelled you to a view not usual at that time? A: The idea that the gates of hell were opening up in Iraq and that the likelihood was one of civil war was the complete opposite of what the administration and the press were saying at the time. Nevertheless, the argument in Naked Imperialism was less one of prediction than a realistic consideration of the forces in Iraq and the historical tendencies that were unfolding. Behind the public face given to the war, there have always been the national security analysts who are trying to view it more realistically, and it is on such assessments that my argument was based. In particular, I relied on the research of Anthony Cordesman, a leading national security analyst in the Ford administration and Middle East expert, who was already pointing out that the occupation was falling apart, and that the question was how the United States could get its troops out before the whole situation degenerated into a full-scale civil war. When you add to this a thoroughgoing critique of imperialism that suggests that “staying the course” is more than a mere slogan and that the high costs to the U.S. soldiers and military, even the likelihood of being caught up in a long-term civil war, may be considered “worth it” to a ruling elite playing a high-stakes gamble for control of world oil and global hegemony — then the full abyss that the United States has opened up in Iraq suddenly becomes apparent. The truth is that there was in Iraq no political base, acceptable to the United States, on which to build a new state in Iraq. The strong organized collaborationist forces upon which a successful occupation (such as Vichy for one or two years) might depend were not present: so there was in fact no solution outside a continuing occupation and perhaps a dismemberment of the entire country. The Shiites no less than the Sunnis were to be prevented from effectively controlling their own country, so any so-called “democracy” could only be a sham. Washington’s goal was eventually to make the occupation less obvious by gradually reducing U.S. troops and pulling them back into permanent bases in Iraq. Even that hasn’t been possible. Incidentally, what I did not know when I wrote this chapter of Naked Imperialism was that the United States was already providing support to paramilitaries/militias in Iraq and was turning to the “Salvadoran Option” of death squads to fight the insurgency. This, however, only generated extreme sectarian strife, evolving into civil war-like conditions. The United States has not been able to control any of this. Hence, the title “The Failure of Empire” was meant to convey the depth of the U.S. failure, which was likely to become inescapable in the ensuing months and years as it became apparent that there was no Iraqi state, the resistance/insurgency could not be defeated, and the U.S. occupation was pushing the whole country into civil war. Yet, in one sense the invasion of Iraq has not (or has not yet) been a complete failure for the U.S. empire. True, the country has been effectively destroyed, the population is either in revolt or in engaging in sectarian killings, death squads are everywhere, the Iraqi government is a sham, U.S. soldiers are dying and Iraqi civilians are being killed in enormous numbers. But still from the standpoint of the empire based in Washington it is not a total loss. The United States may yet end up controlling Iraq’s oil, and Iraq may prove to have the largest oil reserves (including undiscovered reserves) in the entire world. The U.S. now has major military bases in Iraq, bordering Iran and dominating the Persian Gulf. But, to be able to gain from these spoils, the empire will need to remain in Iraq and will have to pay a very heavy price. And this will be constant testimony to the brutal nature of U.S. imperialism. It could prove in the end that the cost to the empire is too high and the empire will retreat, but I do not expect it to relinquish its hold on Iraq any time soon. It will remain for ostensibly “humanitarian” reasons to counter the barbarism that is now Iraq. Q: There is an economic argument that underlies your analysis in Naked Imperialism, made explicit in Chapter 3 “Monopoly Capital and the New Age of Imperialism.” Not to recapitulate the whole argument, but what do you see as the key linkages and causal chains between the economic and the political/military in this current phase of imperialism. A: This could be a very long answer, so I will try to keep it short. Since the 1970s the dominant reality of the U.S. and world economy has been that of stagnation and financial explosion. Although there continue to be ups and downs in the business cycle, and although there are exceptions (most notably China), the general condition of the U.S. economy and the world economy as a whole has been slow growth and rising unemployment/underemployment and excess capacity. Although the economy is generating an enormous surplus at the top (the more so because of stagnating wages and redistribution of income and wealth toward the upper classes), profitable investment opportunities within production have been limited due to overcapacity in key industries worldwide. Under these circumstances there has been a shift toward financial speculation and the financialization of the global economy, which has helped to keep the economy going but has not been able to restart the engine of capital accumulation. Ultimately, the analysis that best explains these developments, I argue, is monopoly capital theory coming out of the work of Michal Kalecki, Josef Steindl, Paul Baran, Paul Sweezy, and Harry Magdoff. These theorists were able early on to point to this set of contradictions, which can be traced initially to the nature of accumulation under the monopoly stage of capitalism, i.e., a capitalist system dominated by a relatively small number of giant corporations. Today I think this analysis needs to be developed further, which I try to do in the book, to take into account the new globalization — or what I would now call the phase of global monopoly-finance capital. In order to understand the forces driving today’s economic imperialism (commonly known as neoliberal globalization), as well as its military imperialism, we have to see them in this larger context of stagnation, financial explosion, world financial instability, and declining U.S. hegemony. In a sense the current imperialist phase is a product of growing instability at the economic base of the system. Q: One of the chapters of the book is entitled “U.S. Military Bases and Empire” and goes over the history of the U.S. empire in terms of the expansion and contraction of its worldwide bases. An explanation we have seen several times for the U.S. war on Iraq is that a primary goal is the establishment of permanent U.S. military bases. How would you address this? A: With the beginning of the War in Afghanistan and the expansion of U.S. imperialism in the form of an overt war in this region, formerly part of the Soviet Union, the whole question of the expanding sphere of U.S. military bases, already evident in the Balkans, became an issue. Also in understanding the extent of the U.S. empire the range of its bases was clearly the key. I therefore undertook a study of the history of U.S. military bases in other countries since the Second World War. One result of this was a map, reproduced in the book, showing the 60 countries and separate territories in which U.S. military bases were located as of January 2002. The map was quite influential and was reproduced frequently on the Internet. Chalmers Johnson relied on some of this research on bases in his useful book The Sorrows of Empire. 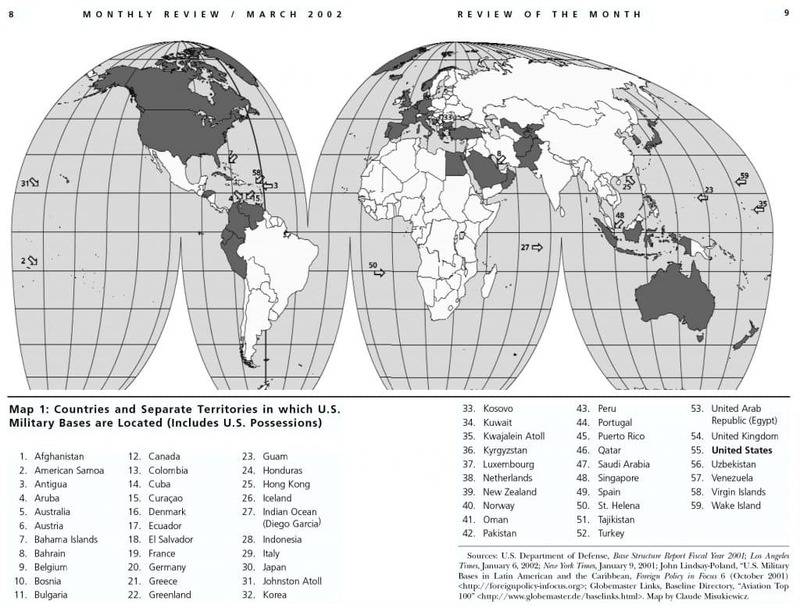 The base map that I developed together with my colleagues at Monthly Review was conservative in that it only included countries with bases that were listed in the Department of Defense’s Base Structure Report (which includes only those with permanent structures) or newly created bases reported in the press. Actual base/troop deployment is more extensive and fluid than that conservative analysis suggests. The United States at any one time has troops in more than 100 countries, often carrying out joint exercises. Since the map was devised, the United States has expanded its bases in every continent of the global South. One thing this tells us, in addition to the size of the U.S. empire and its strategic points of concern, is how thinly spread out U.S. forces are — so that relatively few are available for a major war/occupation as in Iraq. Bases are of course staging grounds for U.S. imperialism and not themselves the reality of that imperialism. They allow for what is called the “forward projection” of U.S. power. Viewed in this way, it is a misnomer to think of bases in Iraq or elsewhere as a primary goal. The bases in Iraq are important because they allow the U.S. to exert control over Iraq and the Persian Gulf as a whole. This is a region considered of enormous strategic value and it is no secret why: oil. What is at issue is the control of oil and the blocking of the emergence of powerful oil states that could threaten the interests of U.S. capital — and not the bases themselves which are mere tools of empire. Q: In Naked Imperialism there are frequent references to “barbarism” as an alternative outcome to the events of these first years of the 21st Century, yet you do not spell out what you mean. It’s not a pleasant line of thought, but what is this alternative, as you see it? A: You are right that the issue of barbarism is frequently referred to in the book. One of the chapters in Naked Imperialism is actually entitled “The Empire of Barbarism.” This reflects the view that capitalism, as witnessed particularly by its naked imperialism abroad, is increasingly degenerating into a kind of barbarism, where war, brutality, torture, misery, superexploitation, all sorts of draconian measures against the poor, border security, anti-immigration, gated homes, racism, extreme environmental devastation threatening whole populations and even the globe, nuclear proliferation (and hence the danger of more terrible wars), etc. are all on the rise. In Marxism this has always been seen as a possibility: that, instead of revolutions taking the world forward, there will be what Marx once called “the common ruin of the contending classes,” a decline into barbarism. Rosa Luxemburg famously raised the question of “socialism or barbarism,” which has been repeated in our own time by thinkers such as Daniel Singer and István Mészáros. Of course, given the history of Western capitalism, the notion of barbarism in modern times carries the implication of fascism. But there is more at issue here: the brutality of the imperialist colonization of the periphery in the early centuries of capitalism, world war, the science of torture, racism, the devastation of the natural world and all beings that depend on it. We are seeing a dangerous resurgence of all of these tendencies in our time. In the view presented in Naked Imperialism, this is a product of the current phase of capitalism, the end of any possibility for a “rational capitalism.” The only answer is the struggle for socialism, a society controlled by the associated producers and the wider sets of needs and values that they represent instead of the invisible hand (now an iron fist) of capitalism/imperialism. Q: In your book you frequently argue that the notion of a “Bush cabal” or a “Bush junta” as an explanation of the war in Iraq is wrong. Now the Democrats have majorities in both houses of Congress and are insisting on a “phased redeployment of the troops.” Any time soon should we expect a fundamental change in Washington’s military posture in Iraq and its approach to empire in the world at large? A: It has always amazed me how quick left pundits both in this country and the world as a whole jumped on to the notion of a Bush cabal, or the “Bush-Cheney junta” as Gore Vidal put it, as the explanation for the War on Iraq and the entire War on Terrorism. In this view. the Republicans effectively carried out a coup in the 2000 election bringing the neoconservatives to power, and it is the neoconservatives that are then to blame for today’s naked imperialism. Not just Bush, Cheney, Rumsfeld and Rice, of course, but also including Paul Wolfowitz, Lewis Libby, Richard Pearle, and various others. In this view, the opponents of the Bush cabal within the Republican Party are the “wise men” like James Baker, Robert Gates, and Brent Scowcroft associated with the administration of W’s father, Bush I. The Democrats meanwhile are seen as strongly opposing the neoconservative Bush II cabal. The fact that neoconservatives have dominated the present administration is of course true and significant up to a point. But, as I argue at length in Naked Imperialism, to suggest that a cabal is somehow behind the sorrows of empire and that we have only to kick them out of office to solve the problem is to ignore all the lessons of history. The present empire strategy has been in the works for a long time — since the fall of the Soviet Union at the outset of the ’90s, or even further back — since the resurgence of stagnation and the first major signs of declining U.S. hegemony in the early and mid-’70s. The war in Yugoslavia took place under Clinton, who also bombed Iraq on a daily basis, and initiated U.S. military bases in Central Asia. The Democrats mostly supported the wars in Afghanistan and Iraq and their criticisms of the Iraq war have been more of a tactical rather than a strategic nature. Thus they fault the Bush administration for unilateralism as opposed to multilateralism in the invading force, the disbanding of the Baathist military, too many military resources directed at Iraq as opposed to Afghanistan, too few U.S. troops in the initial invading and occupying force, corruption in the handling of military contracts, too little armor for the troops, etc. These are not fundamental attacks on today’s naked imperialism. What this reflects is the fact that the U.S. ruling class as a whole (to which the Democrats as well as the Republicans are beholden) has remained strongly behind the larger war. What is happening now since the election, with the Democrats controlling both houses in Congress, Rumsfeld gone, and the Iraq strategy clearly in shambles, is that James Baker, Robert Gates, and other “wise men” of Bush I are being brought in to save Bush II. But we shouldn’t have illusions about a turn toward peace as a result. Gates, the new Secretary of Defense, is a former director of the CIA involved in Iran-Contra. Meanwhile, the Democrats themselves are calling for a “phased redeployment,” which may simply take the form of a redeployment of troops within the global war — more to Afghanistan, more to bases in Iraq — rather than a withdrawal from Iraq or a pulling back from the imperial War on Terrorism in any way. Given the changes in Washington, we will soon get a reasonable test of the cabal thesis, which will doubtless demonstrate that the grand imperial strategy will continue to be pursued, however much things may change at a tactical level. Where the Democrats are most likely to resist is not in regard to the imperialist strategy but in relation to the homeland security measures adopted domestically, which are an internal counterpart of this overall strategy. But it is unlikely that the Democrats will, for example, take a strong stand against the Patriot Act. Here too they will most likely play a game of changing things on the margins, while accepting the larger erosion of democracy and human rights. In fact the value of Naked Imperialism in comparison with such cabal theories is that it is rooted in an unrelenting critique of capitalism and imperialism. The emphasis then is on the real forces associated with the imperial juggernaut. This is not to say that things are inevitably determined by such powerful structural forces that there is no escape from these imperial relations, no basis for hope. But it does tell us that if there is going to be any fundamental change in the course of history it will not occur among the elites. Rather it will have to be carried out radically from below, and not simply by throwing out a cabal or through the election of the other wing of the ruling two-party system. What we need is change on a much more revolutionary scale, which means that the people must take history into their own hands once again. John Bellamy Foster is professor of sociology at the University of Oregon, author of Marx’s Ecology and Ecology Against Capitalism, and editor of Monthly Review.